Island Navigator is being built at Kawasaki Heavy Industries’ Kobe shipyard in Japan. Image courtesy of Island Offshore. The vessel will use six Bergen Diesel generator engines for propulsion. Image courtesy Rolls-Royce plc. The vessel will feature DP3 dynamic positioning. Image courtesy Rolls-Royce plc. Island Navigator is an offshore service vessel owned by Norwegian offshore service provider Island Offshore. The vessel, which is being designed for worldwide operations, will be built by Kawasaki Heavy Industries (KHI) at its Kobe shipyard in Japan. KHI was awarded the contract to build the ship in January 2014 and is expected to hand her over to the owner in the first quarter of 2017. Engineering works will be performed jointly by Kawasaki and Rolls-Royce. Built according to mobile offshore unit (MOU) regulations, the vessel will be outfitted to perform a range of subsea operations, such as top hole drilling, logistics and supply, subsea construction and anchor handling, as well as inspection, maintenance and repair (IMR) work in deep waters. It will also be adapted to undertake light well intervention. The vessel will be able to perform offshore drilling operations in severe weather conditions of the North Sea and at the new frontiers in the north. 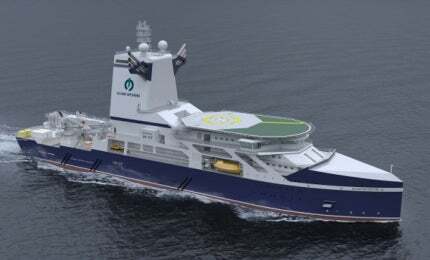 Island Pride is a new multi-functional subsea construction vessel built at VARD’s shipyard in Brevik, Norway, for Island Offshore. Island Navigator will be of Rolls-Royce type UT 737 CD design, and will have approximately 168.8m length, 28m moulded breadth and 11.7m moulded depth to main deck. The ice-class vessel will feature DP3 dynamic positioning and will be capable of accommodating up to 91 people onboard. Rolls-Royce will be supplying the design and engineering package for the offshore vessel under a £25m contract. The scope of the contract also includes a propulsion system, as well as control and automation systems. Island Navigator is being custom-built and will integrate an enclosed module handling tower generally improving the safety and working conditions for crew members while operating in harsh and extremely cold weather conditions. The vessel will be equipped with a bulk handling system capable of carrying 202m³ of cargo. Rolls-Royce will supply an automation package for installation onboard. The package will include a Rolls-Royce automation system (ACON), control consoles, emergency telegraphs, an electrical test panel and a low voltage system. The topside handling equipment for the vessel will be supplied by National Oilwell. The new UT 777 CD design vessel for Island Offshore will include a deck machinery package comprising one double windlass / mooring winch, two mooring winches at the aft, chain stoppers and three hydraulic pump units. The ship will be equipped with a cargo rail crane with a maximum outreach of 19m. "Rolls-Royce will be supplying the design and engineering package for the offshore vessel under a £25m contract." Island Navigator’s propulsion system will comprise three Rolls-Royce azimuth thruster systems, which will be located at the stern and the bow. The rear systems can be pulled back into the hull when not in use thereby reducing the vessel’s drag. The vessel will also be outfitted with two ‘super silent’ side thrusters and a Helicon-X3 propulsion control system. Helicon-X3 is based on Rolls-Royce’s ‘common control platform’, which makes use of standard modules, limiting the number of spare parts to be carried onboard the vessel if it is equipped with a range of Rolls-Royce products. Island Navigator is powered by a diesel electric power and propulsion plant, equipped with six generator engines comprising four Bergen Diesel B 32:40L9ACD generator sets, which will generate a maximum of 4,190eKW, and another two B 32:40V12ACD with a rating of 5,587eKW at 720rpm each.